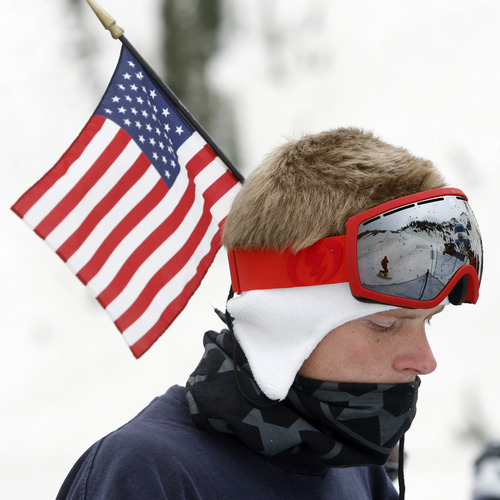 Snowbird • Red, white and blue crowd celebrates last day of record 202-day season. Snowbird • Who knows when the chance will come again to ski/board in so much snow on the Fourth of July? 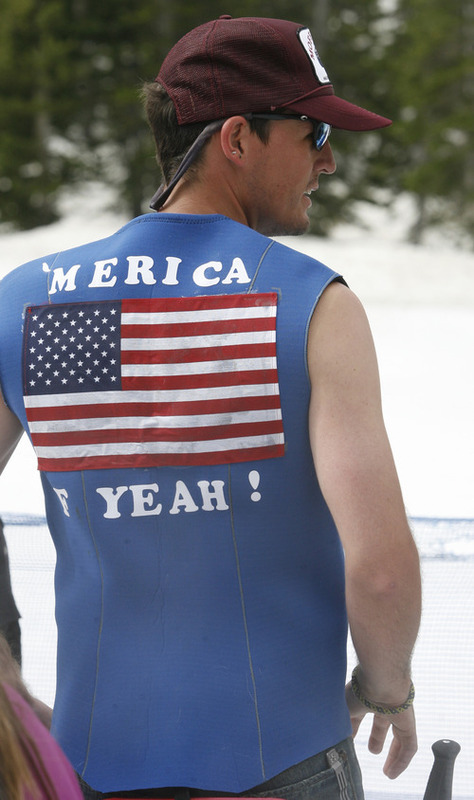 That uncertainty served as a siren's call for thousands of people Monday, lured to the slopes of Snowbird Ski & Summer Resort in all sorts of attire to celebrate  well, to celebrate a lot of things  above all the very notion of skiing on Independence Day. "It's a good day to be whoever you want," said Charlie "Sharky" Cornell, a middle-aged man sitting shirtless on the Snowbird Plaza and drinking champagne a little after 10 a.m. He was checking out the colorful costumes in a Tram line that snaked between tables, packed with people, all the way to the bridge that crosses Little Cottonwood Creek. There were Uncle Sams all around. People in Hawaiian shirts and shorts. Mini-skirts. Imaginative concoctions of this and that in red, white and blue. Lexi Dowdall, 25, of Salt Lake City, sported a tiny jacket covered with patches displaying scenes of American pride, like spaceships blasting off. Stars adorned her blue denim shorts. 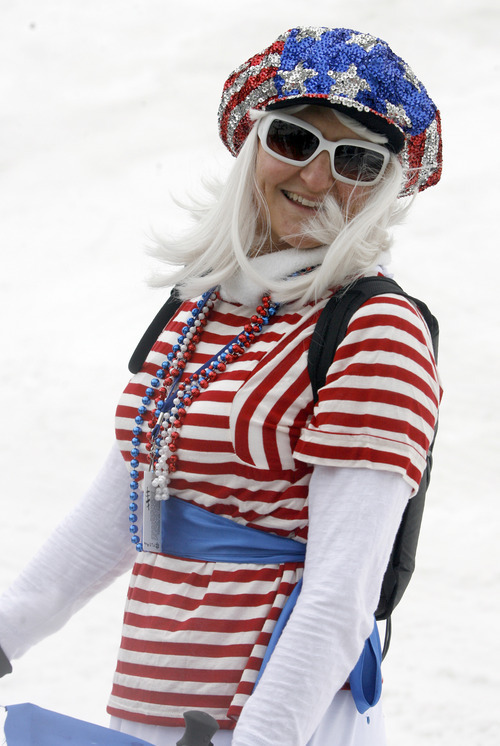 "Just trying to promote the American spirit," she said while waiting to board the Tram, operating for the 202nd day of the 2010-11 season, a Snowbird record after an extra-early opening in November. 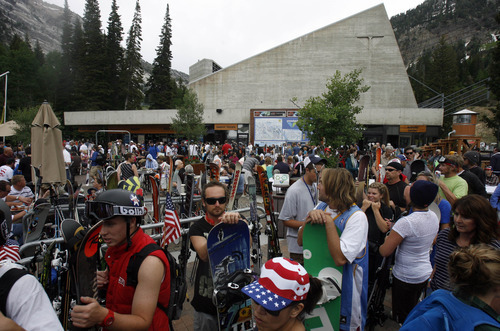 The crowd arrived early, knowing summer's heat would take a quick toll on the resort's incredible 87-inch midmountain base. The Entry 2 parking lot filled by 7:30 a.m. All of Snowbird's lots were packed by 9:11 a.m., said Dave Fields, resort operations manager. From then on, drivers had to park on the Little Cottonwood Canyon Road and make the long hike to the plaza. "I couldn't be more excited," beamed Zach Bowcut, 25, of Holladay. 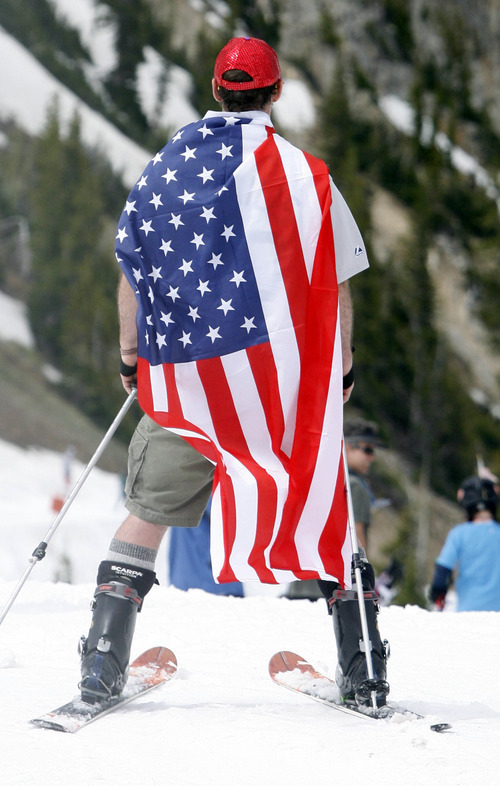 "I've never skied on the Fourth before," said Jim Nichols, a Snowbird season pass holder from Salt Lake City. "The latest before was Father's Day. So this is three weeks better. It's the greatest. You have to experience it once." Paul Prieto agreed. "I flew in from Hawaii for this," he said. "I was surfing the North Shore on Sunday." That's desire. That's freedom. And that's why Jane Rackl, 50, of Salt Lake City, shouted "because we can," when asked about skiing in a curious outfit that was part Hawaiian, part thrift shop. 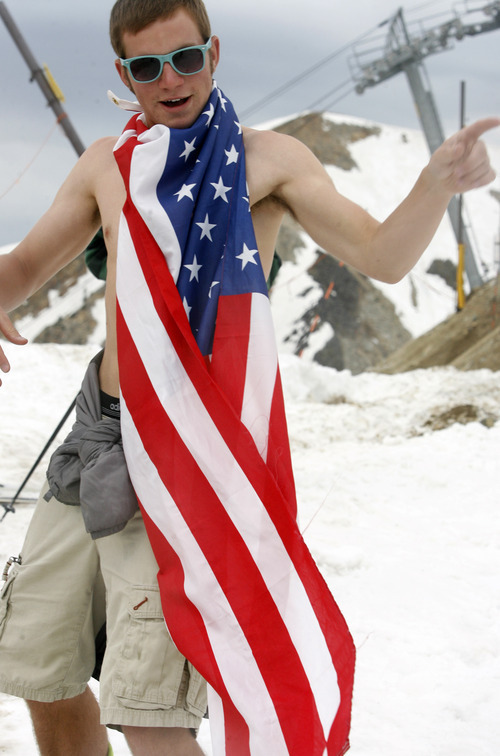 She then posed for pictures atop Hidden Peak with her friend, 35-year-old Rachel Collet, who was dressed like a Swiss yodeler and drinking a can of Pabst Blue Ribbon beer. Even in this kooky crowd, they attracted quite a bit of photographic attention. But not as much as the daring few, both men and women, who bared almost all above the boot line. Cat Killfoil of Park City received loud applause from the largely male line at Little Cloud lift when she skied up in a skimpy pink and purple bikini, pumping her ski poles into the air. 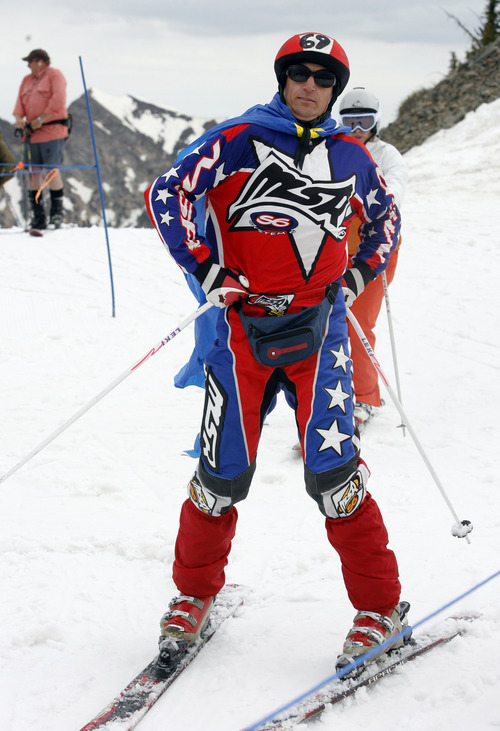 Having spent the last year as one of Ski Utah's "Ultimate Powderhound" bloggers, the 29-year-old Killfoil knew how unusual this opportunity was. 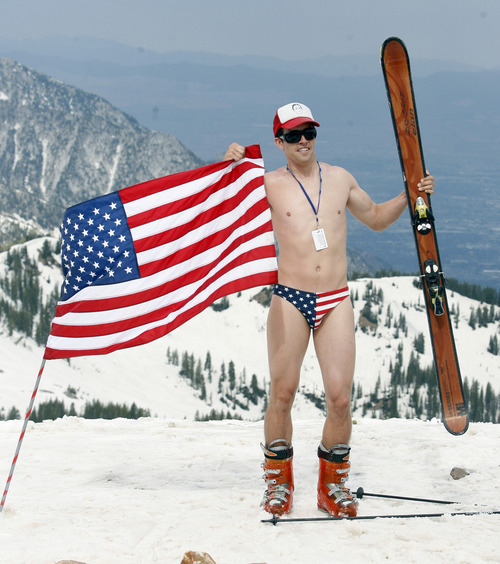 Snowbird has offered skiing until July 4th only three times since its December 1971 opening. "You have three chances in 39 years to do something silly like this. I had to do it," she said as phone cameras aplenty documented her attire. "I have a son in Siberia who's been through a long, cold winter. Would you wave to him?" begged one man. She laughed it off. "Everybody's having fun. That's what it's all about today." Monday was also about the 235th anniversary of the United States independence. And so during one Tram ride down from the mountain top, Rachel Barker of Salt Lake City burst into a spirited solo rendition of "The Star Spangled Banner." By the time the Tram reached the plaza, nearly everyone inside the half-full car was singing along. Snowbird closed Monday after a record 202-day season. Since fall, the resort had received 783 inches of snow and finished with an 87-inch midmountain base.